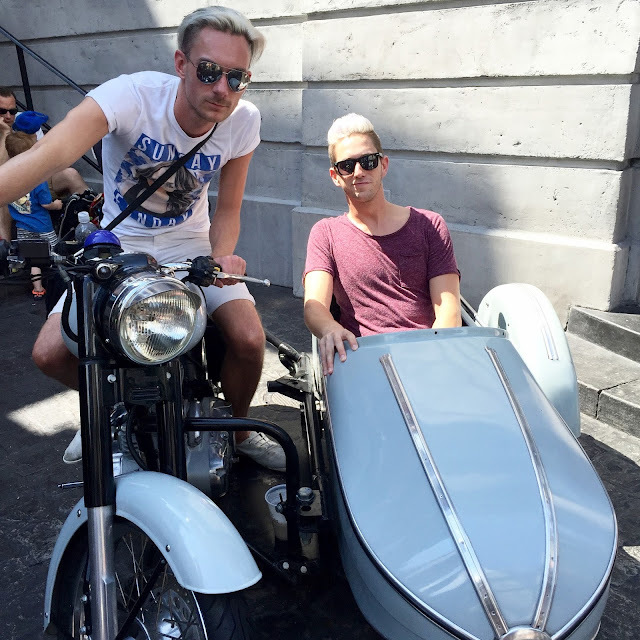 Part 2 of our Harry Potter World adventures took us over to Universal Studios to visit Diagon Alley! 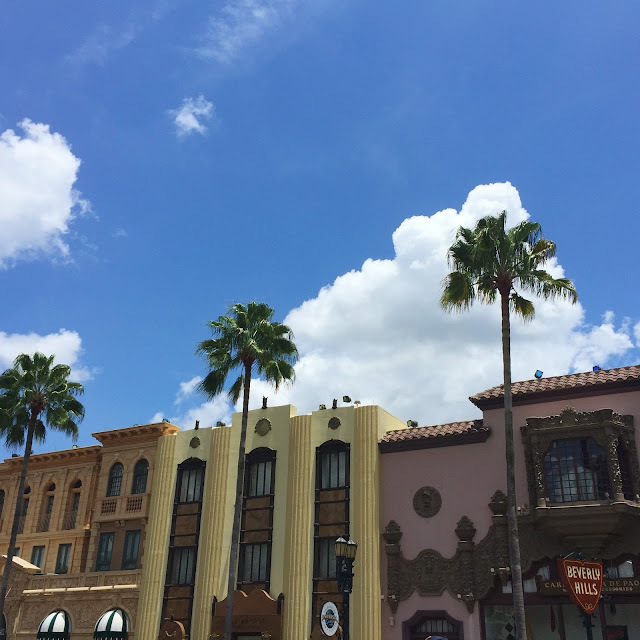 Just as it is in Islands of Adventure, you need to walk through the entire Universal Studios park to reach Diagon Alley. 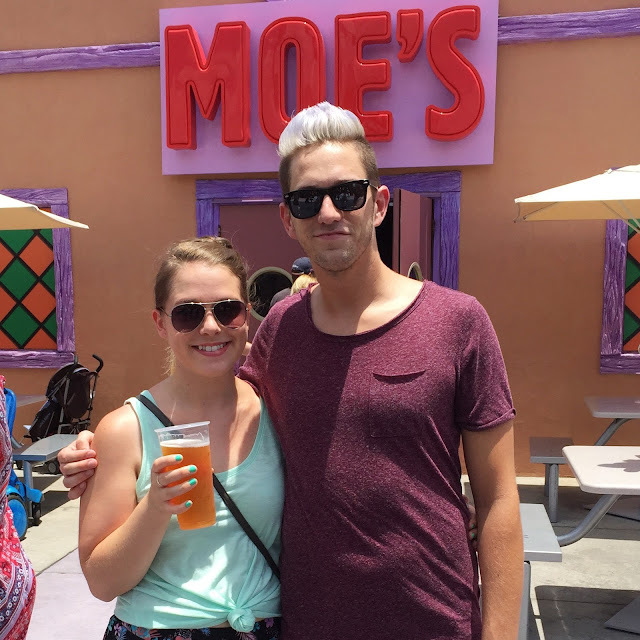 Along the way, we soaked in some awesome "Old Hollywood" sites and charm, enjoyed some Duff Beer at Moe's, helped E.T. escape to his home planet, and completed our MIB alien identification training. 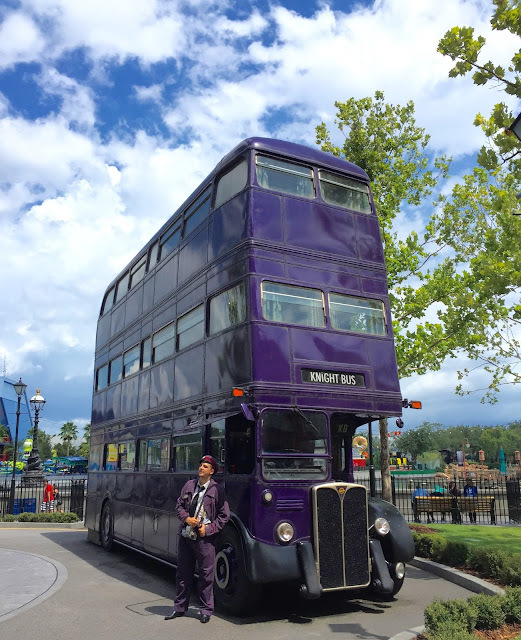 As soon as we caught a glimpse of the Knight Bus rising up in the distance, we knew we were in the right place. Diagon Alley was amazing, impressive, and intense. You are completely overwhelmed with the hustle and bustle of the real Diagon Alley as you marvel at the detail and scale of the experience. Unlike Hogsmeade and Hogwarts, Diagon Alley has a great deal more to explore, with hidden alleyways, and multiple streets filled with shops and experiences. 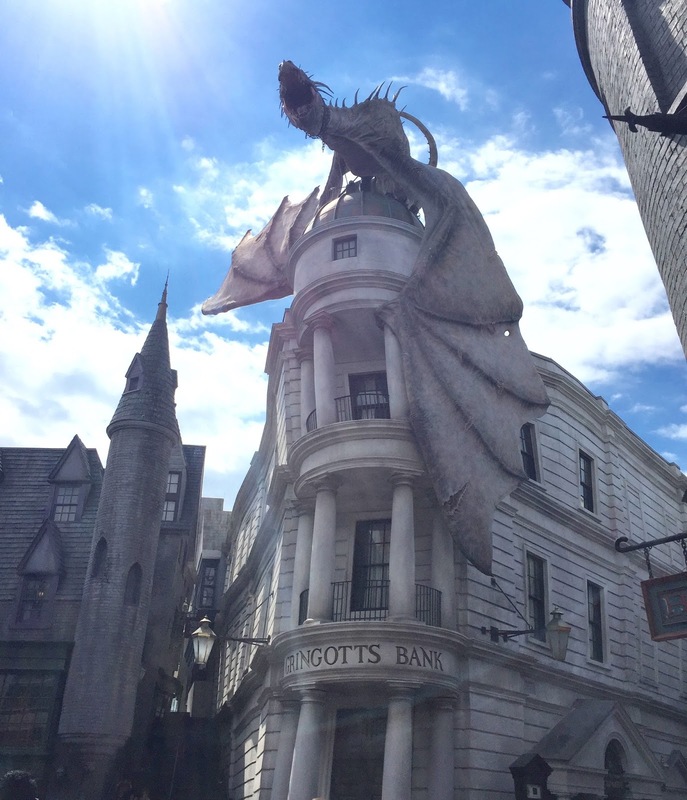 Your first glimpse down the main drag as you enter the alley is of the immense, literally fire-breathing dragon perched atop Gringotts - a site I will not soon forget! Potentially the only drawback to the Diagon Alley part of the Harry Potter World experience is that there is only one ride. However, it's a doozy. 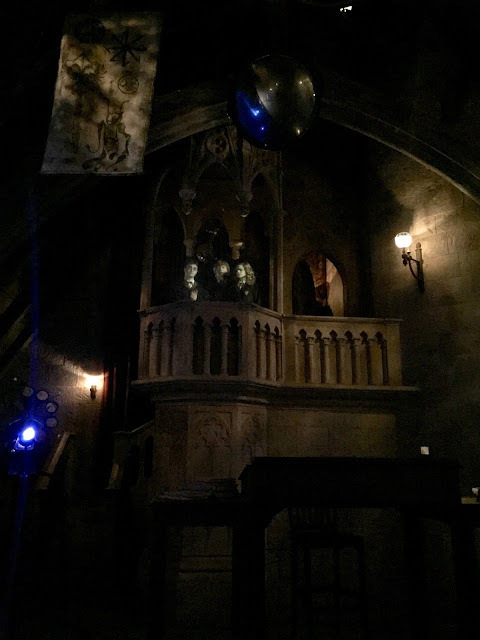 Escape from Gringotts: Like "Harry Potter and the Forbidden Journey" from Hogwarts, this is a rollercoaster/simulator hybrid. This one, however, is a little heavier on the roller coaster aspect of it, and requires you to wear 3D glasses. We were incredibly excited for this ride, but sadly to say, we were a bit disappointed. It's not that the ride wasn't great, it was that there was some sort of mechanical failure during our experience, and we were stuck inside the ride for about 15 minutes. That chunk of down time really killed our mood, our expectations, and essentially ruined our judgement of the remainder of the ride. 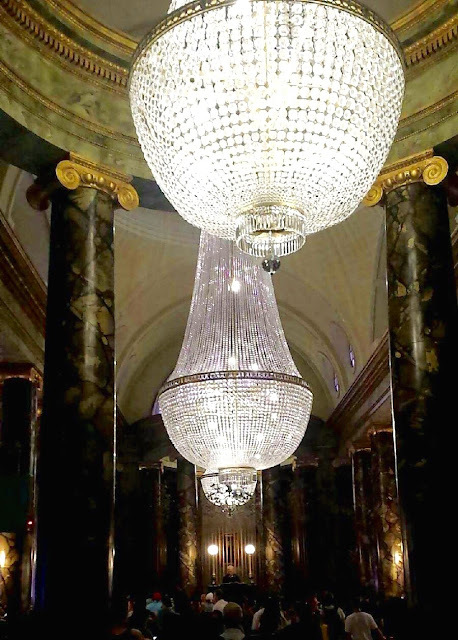 The one cool part, however, was getting to walk through the lobby of Gringotts and seeing the beautiful (and ginormous) chandeliers and all of the Goblins hard at work! 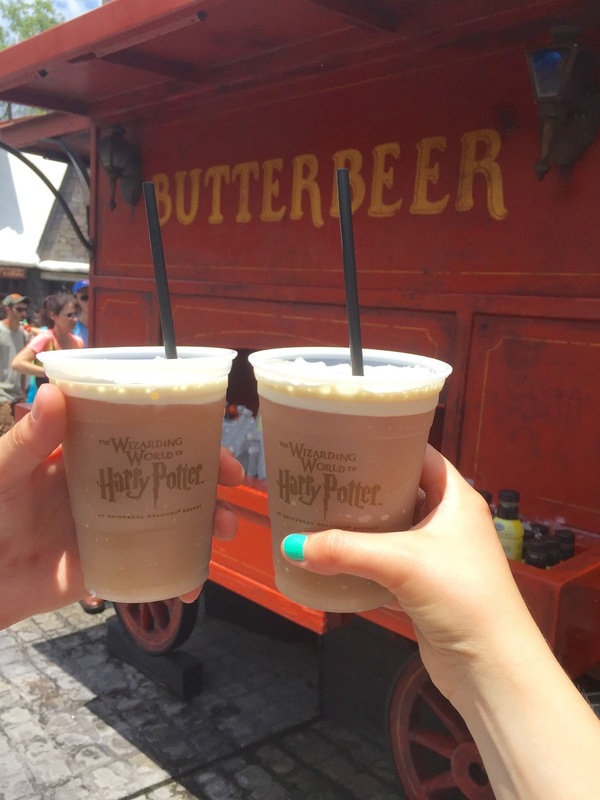 Butterbeer, butterbeer, butterbeer! Of course it was every where you turned, and of course we enjoyed some more. 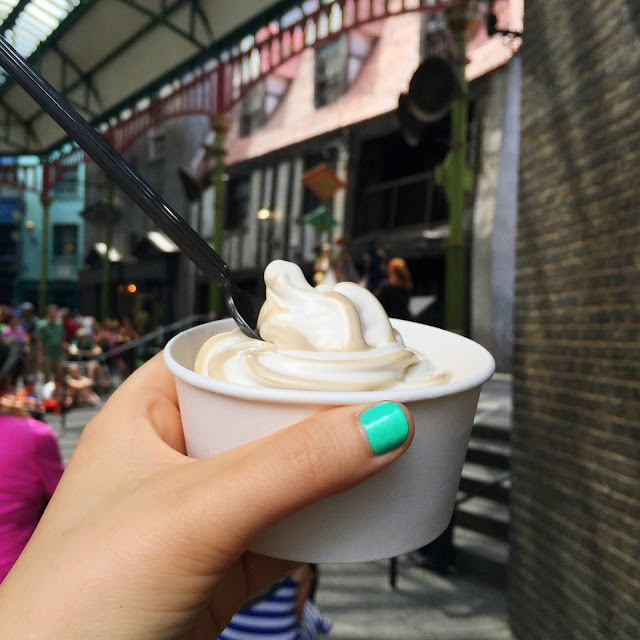 In addition to butterbeer, we and our friends sampled some Fire Whiskey (think Fireball, but smoother), and some Butterbeer Ice Cream (think vanilla ice cream, with butterbeer syrup - yummmmm). 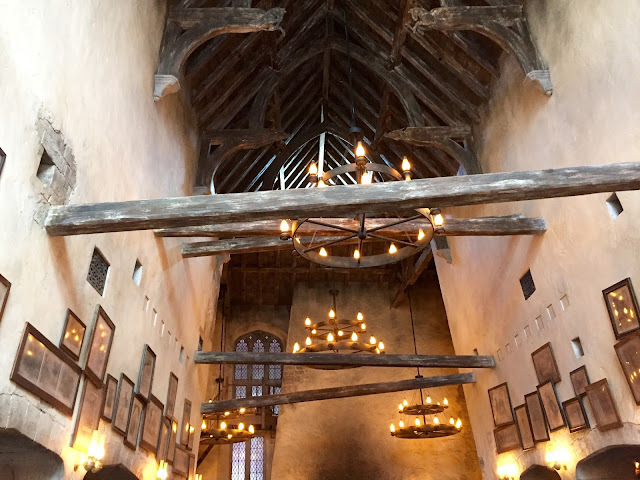 The Leaky Cauldron: The food here was very similar to the Three Broomsticks in Hogsmeade, but since the interior of The Leaky Cauldron is featured a bit more prominently in the movies, it was a cooler experience. We were able to recognize the layout and decor of the place (like where Arthur Weasley pulls Harry aside to talk to him about Sirius Black escaping from Azkaban). Ollivader's Wand Shop: We entered Ollivander's just thinking it was a shop where we could browse and potentially purchase wands. Little did we know, we were also attending the "wand chooses the wizard" show with about 20 other park guests. 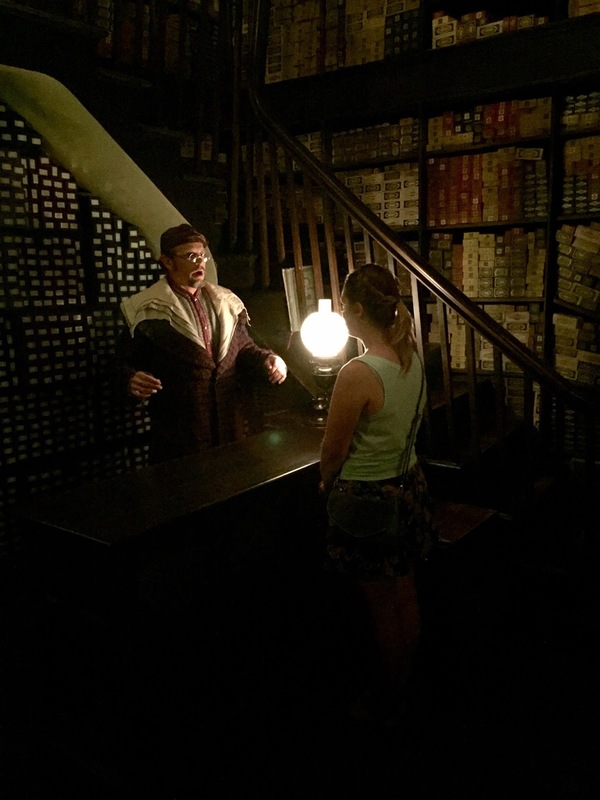 During this show, Ollivander selects one attendee ("a wizard with much potential!") for the wand choosing. I don't mean to brag, but... OLLIVANDER PICKED ME! I'M NOT A MUGGLE AFTER ALL! Here's a rather dark video of me finding THE PERFECT WAND (vine with a phoenix tail core, in case you're curious.) Prior to finding the wand that was meant for me, I had to try a couple others and caused a bit of mayhem (not caught on tape, unfortunately.) 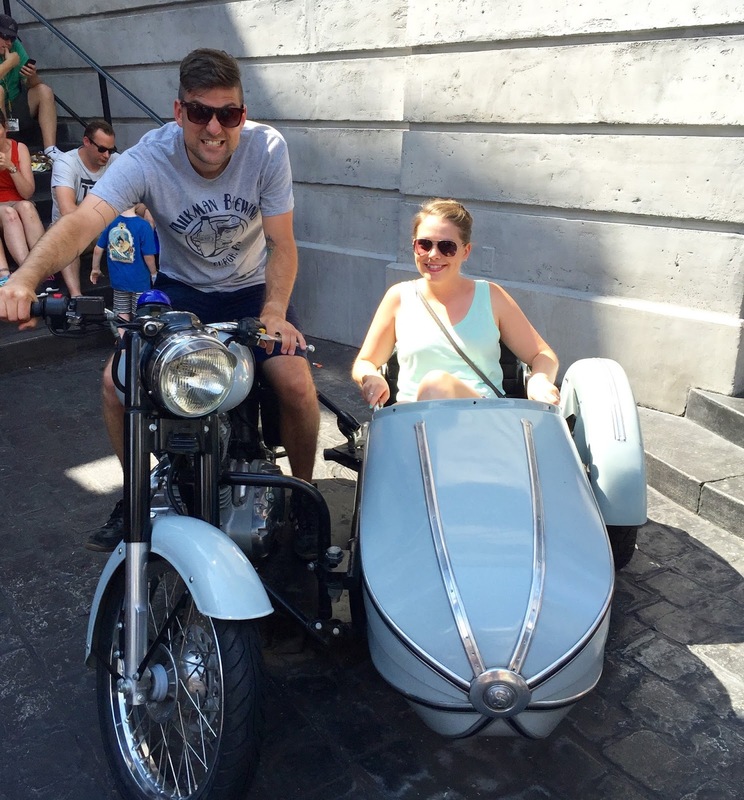 The whole experience was so awesome, but I still had to pay $47 to keep the dang thing (seriously, Universal?) 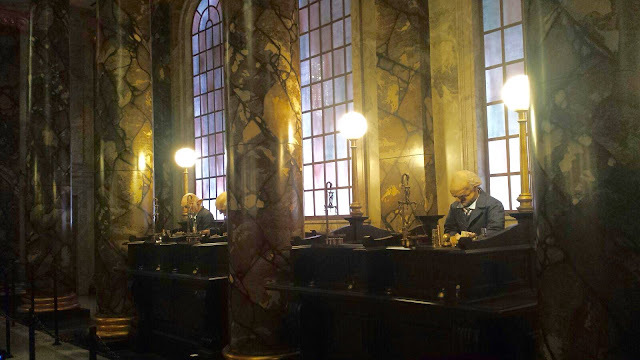 The coolest thing about the wands, which we briefly mentioned in the previous post, is that they are interactive. 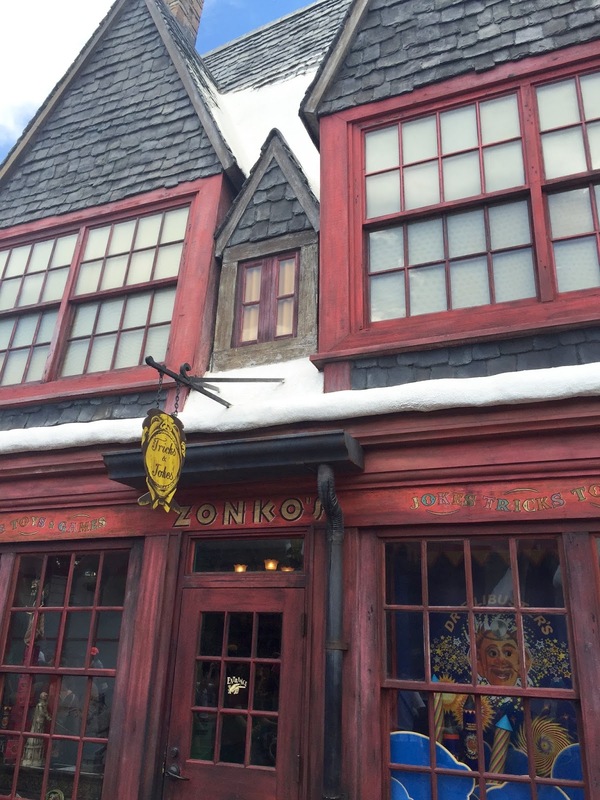 You can take them to different storefronts in the Wizarding World and MAKE MAGIC HAPPEN. Enough said. Weasley's Wizard Wheezes: This is a super fun store to explore. 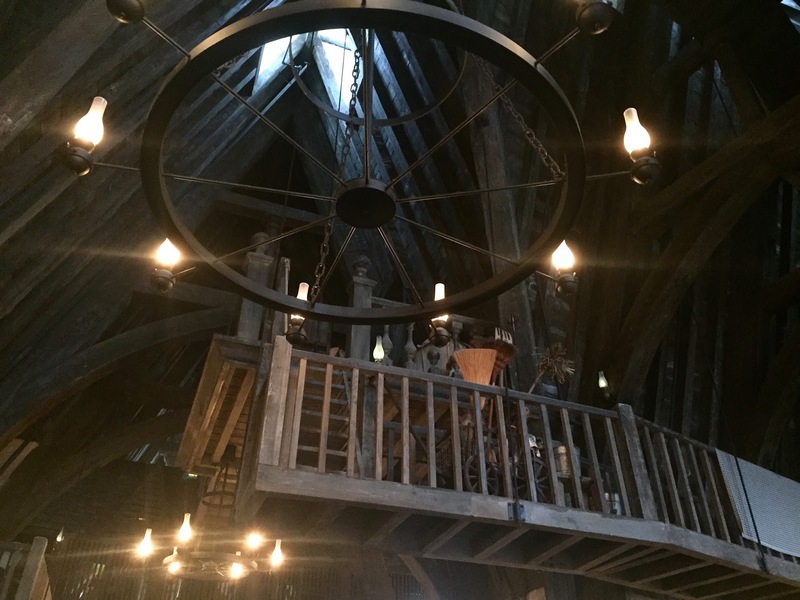 So much of it is set up just like in the film, from featuring products like Puking Pestules, to seeing Umbridge riding a unicycle while carry cauldrons on tight rope high above. 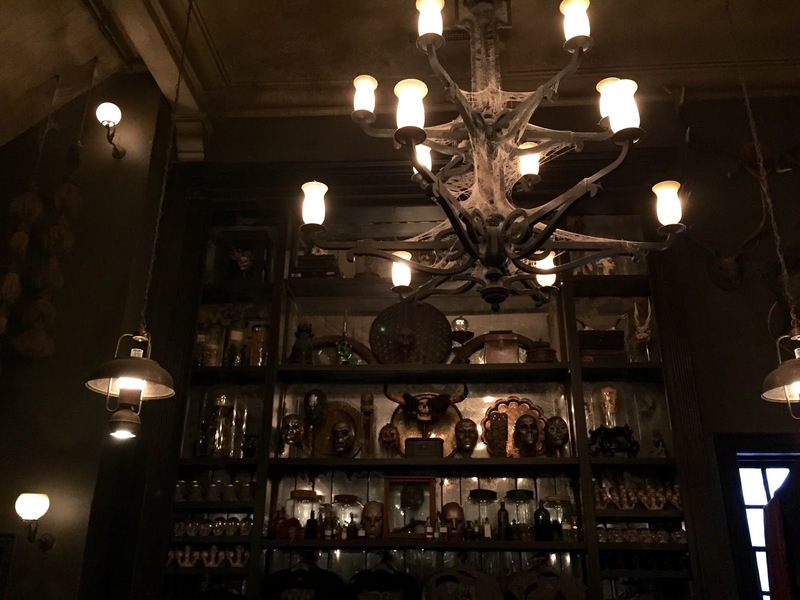 Borgin and Burkes: No sooner did I say, "I wonder if they have a Knockturn Alley here somewhere" did we stumble right into it. Cold, and dark, this was very interesting to explore. In here we of course went into the famous Borgin and Burkes to see skulls, dark magic tools, the Death Eaters' Vanishing Cabinet, and tons of other great gizmos and gadgets. Our friends purchased awesome Dark Mark tattoos to sport on our last day at the park too! 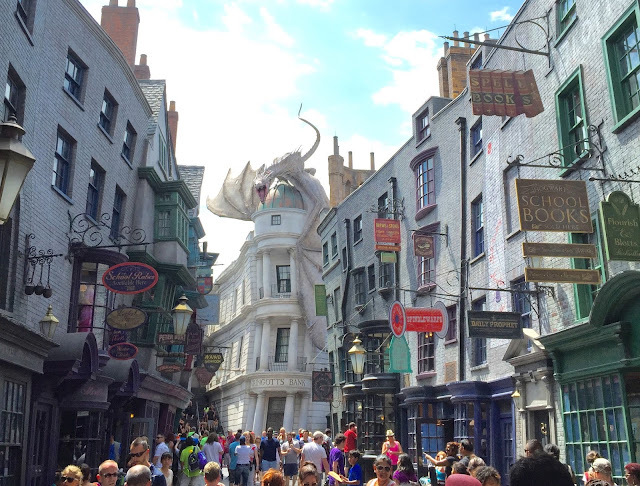 Marvel at the giant fire-breathing dragon, snap some pictures of Hagrid's flying motor cycle and side car, cool off in the dark and mysterious Knockturn Alley, enjoy a puppet/magic live show on stage, and use your wand to make magic happen in a storefront window! 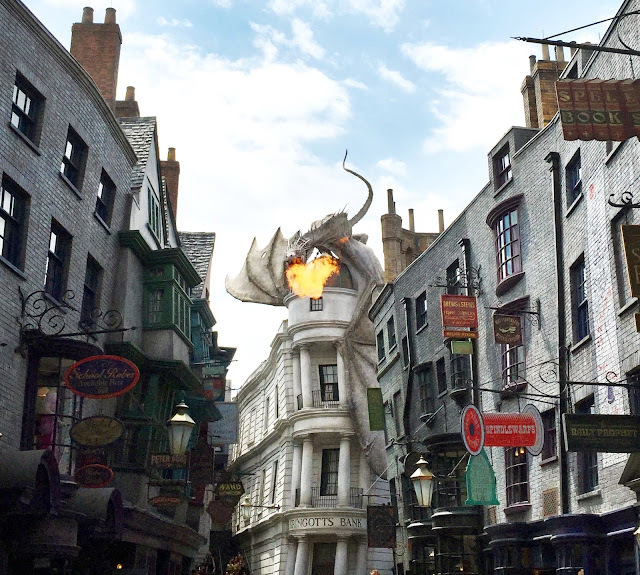 Like I said earlier, Diagon Alley has loads to explore, and it would be easy to do so for an entire day. We truly had such a fantastic time on this trip. I'm so glad that we finally got to fulfill our dreams of feeling like true wizards and share the experience with friends as well. 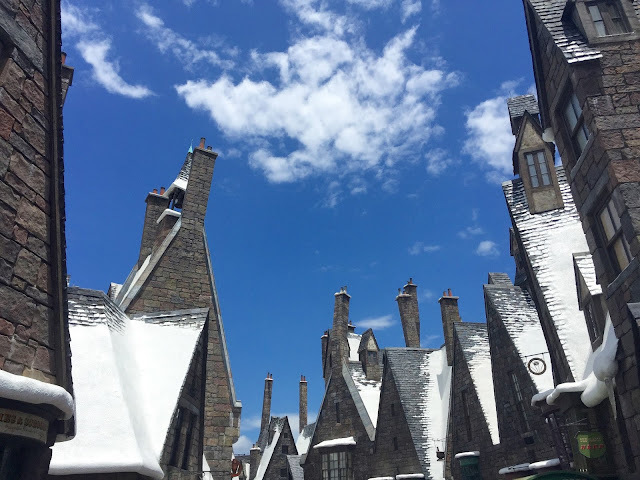 If you have any questions about The Wizarding World of Harry Potter, be sure to let us know because we'd LOVE to talk about it forever and ever! Vacation's not quite over yet though! Soon we'll share more about our visits to Charleston, South Carolina and Raleigh, North Carolina on our 1,200 mile road trip home from Orlando! Stay tuned! 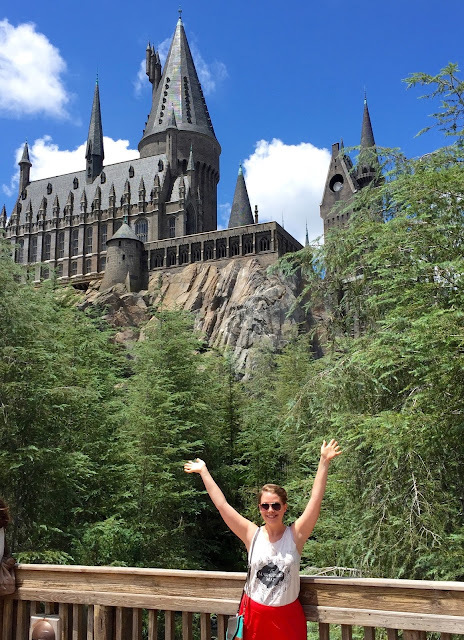 "It does not do to dwell on dreams and forget to live," said Albus Dumbledore, and I couldn't agree more. 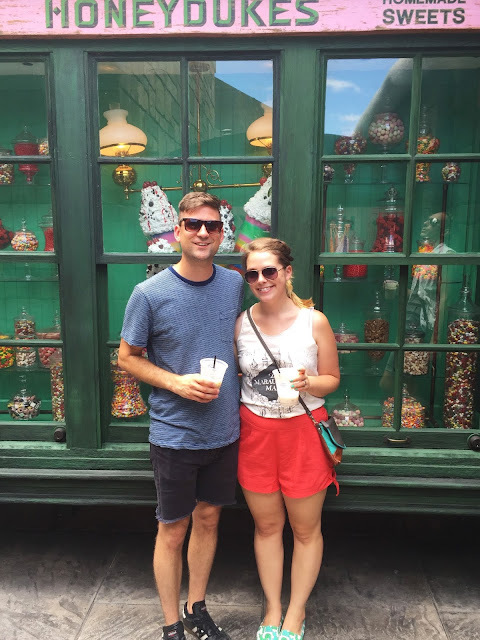 Nick and I have been dreaming of visiting the Wizarding World of Harry Potter in Universal Studios for years now, so this summer we made those dreams a reality! 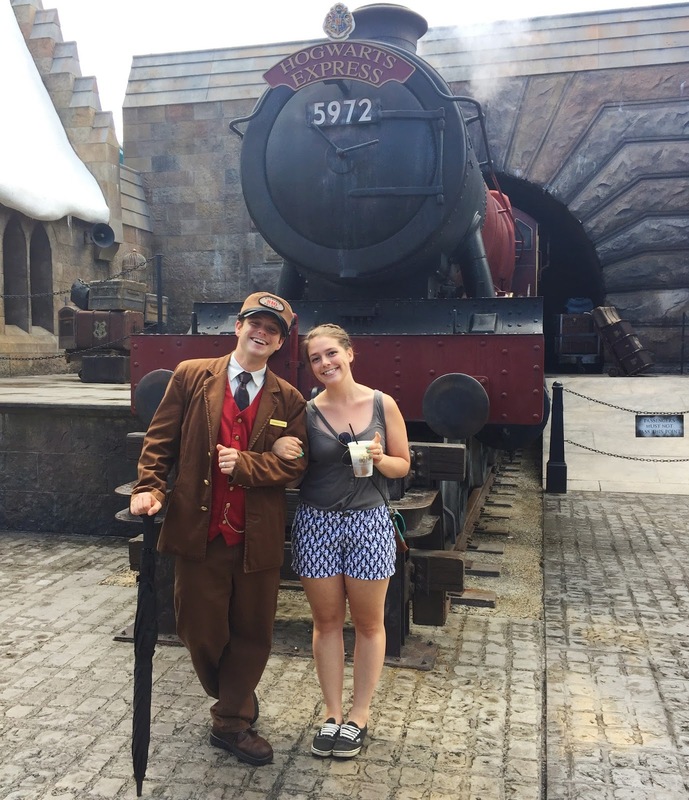 With friends eager to join us and vacation time waiting to be used, we made a spur of the moment decision a few months ago to book a flight, order our park passes, and hop aboard the Hogwarts Express to Harry Potter World! There is no way this blog post is going to do our trip justice, because we had the best time we could possibly have. 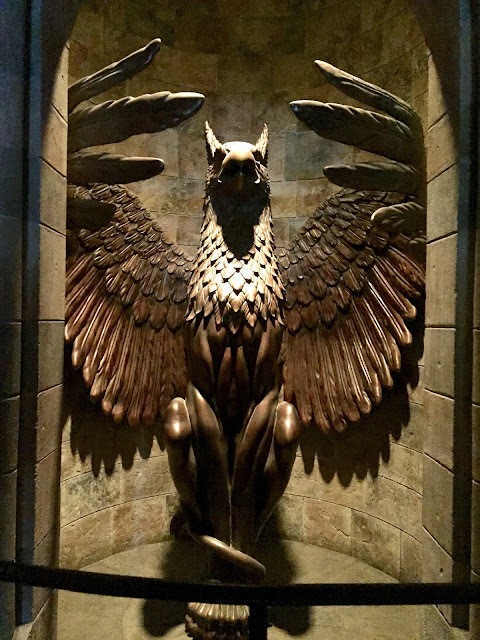 I've never felt so much like a true Gryffindor in my life and I think I would be happy spending every day sipping butterbeers in Diagon Alley, talking about last night's quidditch match, and practicing new spells to annoy the Slytherins. I'll have to keep thinking about how to make those dreams come true, but for now I'll recap Part 1 of our three-day HP adventure for you - enjoy! 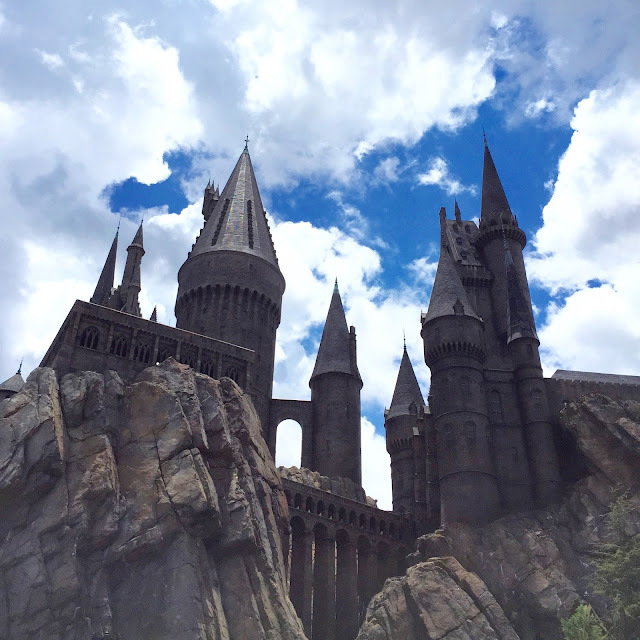 The Wizarding World of Harry Potter is located in two different Universal Studios theme parks in Orlando, Florida. 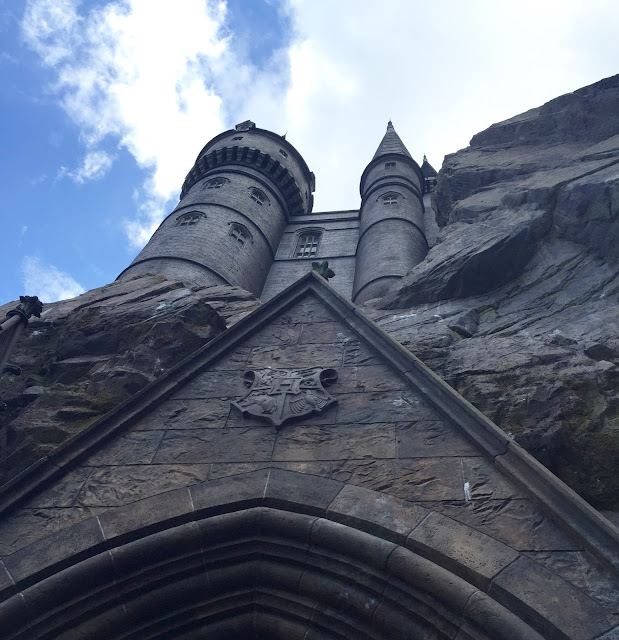 Hogwarts and Hogsmeade are in Islands of Adventure and Diagon Alley is in Universal Studios. If you have "park-to-park" passes, you can ride the Hogwarts Express to visit both parks on the same day, however, we just spent two days in Islands of Adventure and one day in Universal Studios. 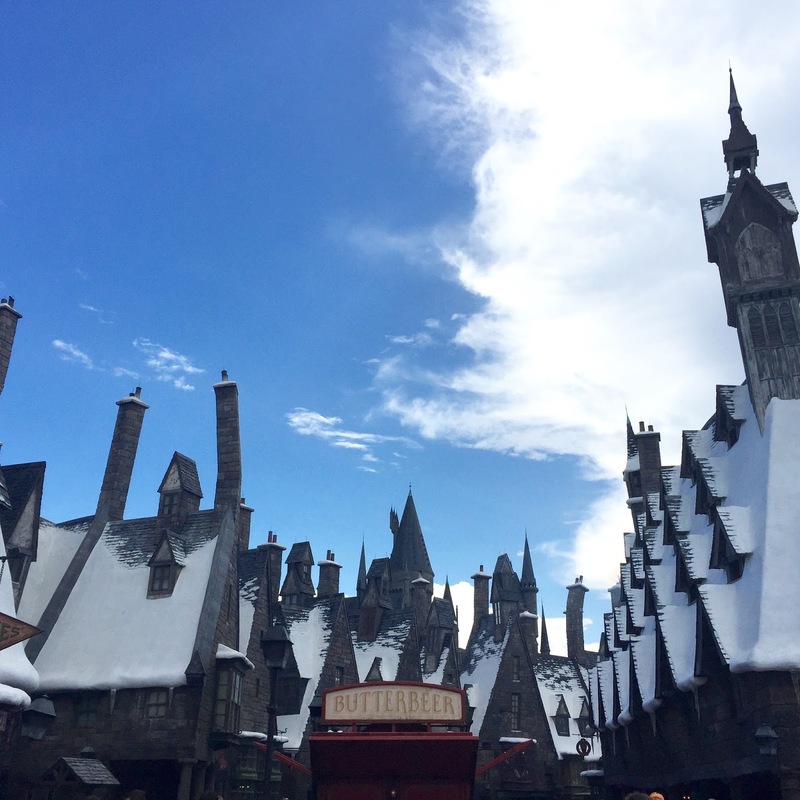 When you walk into Islands of Adventure you have to trek through the entire park to get to The Wizarding World, but as soon as you see the snow covered roofs of Hogsmeade and Hogswarts Castle in the distance, it's alllllll worth it. 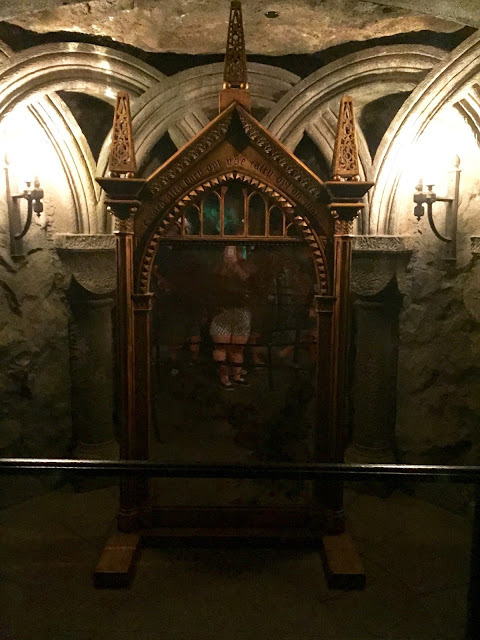 Harry Potter and the Forbidden Journey: This ride was the very first thing we did at the park and it was AMAZING, AMAZING, AMAZING. Oh hey, did I mention, amazing?! 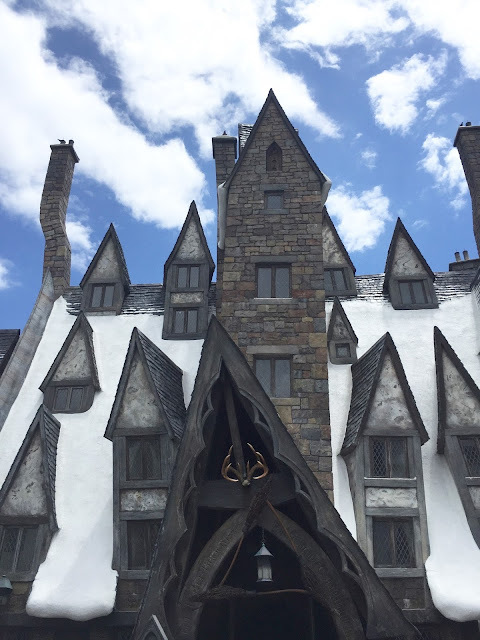 This 3D simulation/roller coaster hybrid is inside Hogwarts, so not only do you get to experience an incredible ride, you also get to see inside the castle that you've dreamed about living in for years now. Flight of the Hippogriff: This was the kid/family friendly roller coaster just outside of Hogwarts. It was fun to see Hagrid's hut and an awesome life size Hippogriff. We used this little ride as a stepping stone to build up Nick's roller coaster nerves. Dragon Challenge: This roller coaster is a little like Lightning Racer at Hersheypark (for our fellow PA readers!) Now, Nick has always been super terrified of roller coasters, but I think it's safe to say that we successfully converted him on this trip! We warmed up with the Flight of the Hippogriff ride and went straight on to the Dragon Challenge. He was looking pretty terrified at the offset but by the end he was all about it. It's a "leg dangling" ride (not sure if that's the technical term or not...) and was easily one of the funnest rides in the park. We rode it a total of 3 times: Once on the blue (Hungarian Horntail), once on the red (Chinese Fireball), and once more on the blue. There is some debate among our friends over which one is better, but here in the Surznick household, we're bigger fans of the blue side! Butterbeers! : Need I say more, really? Okay, I will. 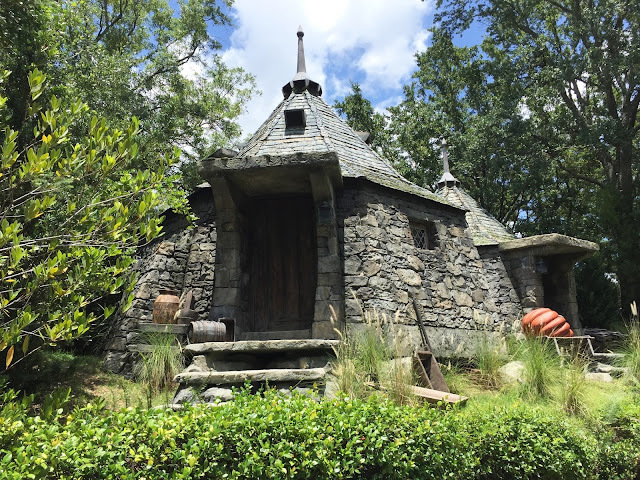 There are a ton of places to get butterbeer in Hogsmade, but we most often went to the cart outside Hogwarts. 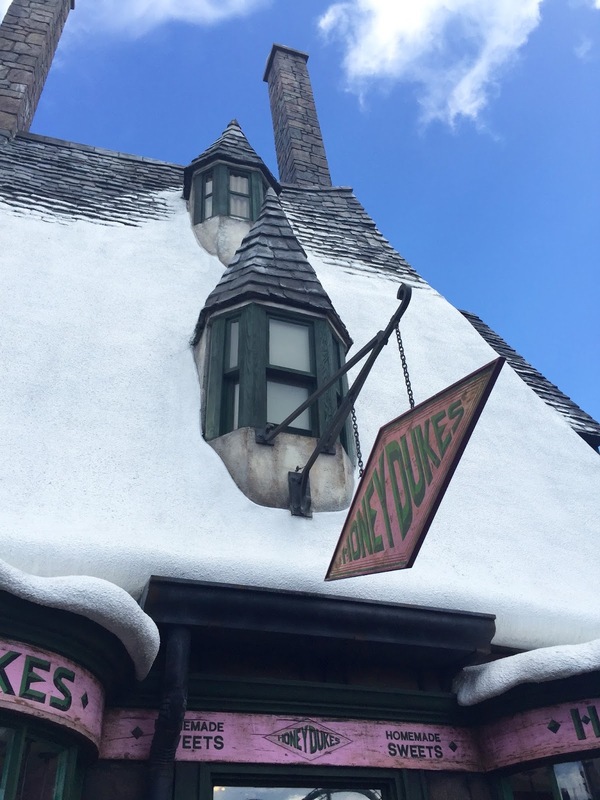 You can purchase your butterbeer either cold (like a soda) or frozen (like a slushie). We went frozen every time with no regrets. The Three Broomsticks: We stopped into the Three Broomsticks for lunch (and to escape a massive downpour that left us soaked to the bone!) There aren't any meal options that are clearly vegetarian, but the staff was very accommodating and let us create a "veggie platter" with any three meat-free items. We also split a Pumpkin Juice, which was super yummy and would be a great drink for autumn. Think cinnamon pumpkin spice latte, in juice form. 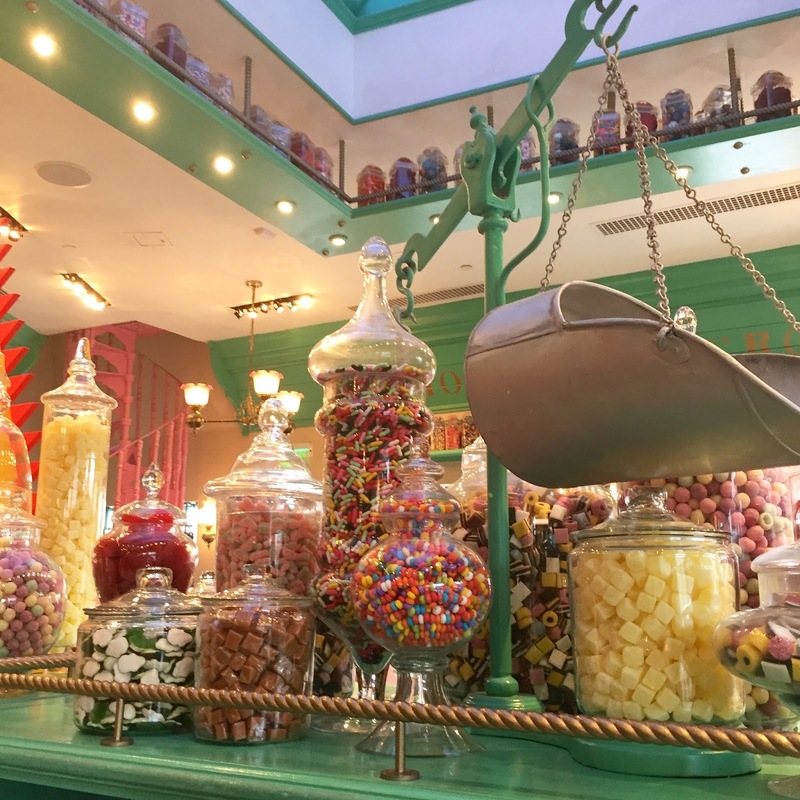 Honeydukes: Stop in to pick up some chocolate frogs or Bertie Botts Every Flavoured Beans! 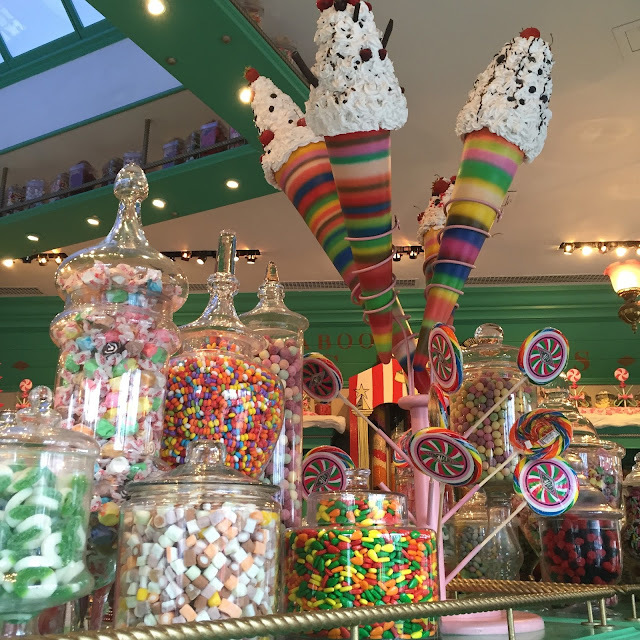 Or just admire all of the colorful confections like we did! There are a few other shops that look like true Hogsmeade shops, but are actually just park merchandise stores. 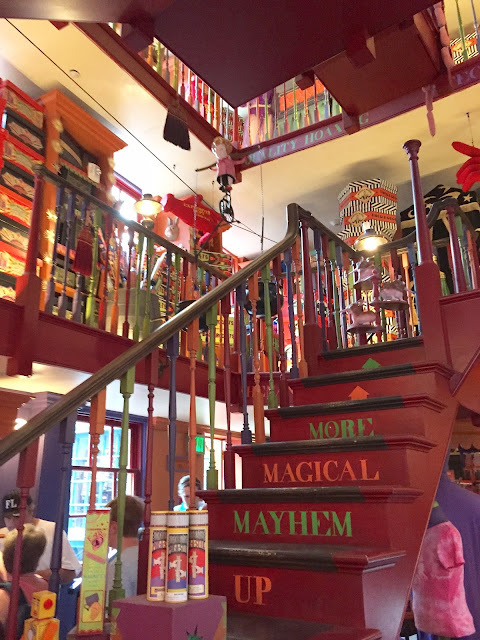 One of the coolest things about each of the storefronts is that if you purchase an interactive wand, you can actually make magic happen in each storefront window! 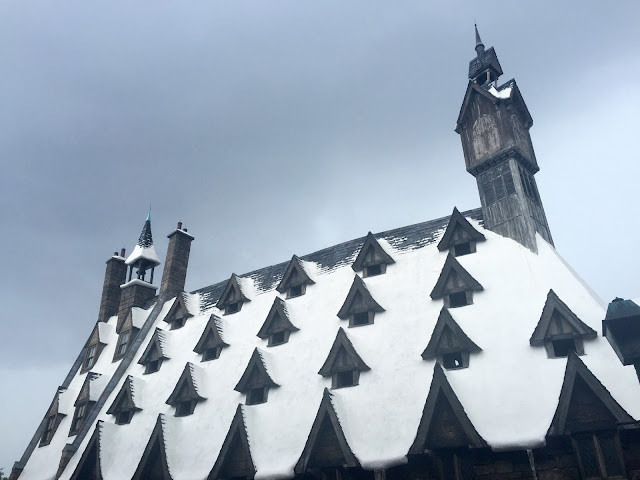 The Hogwarts Express: Though we were unable to ride the Hogwarts Express without park-to-park passes, we still snapped some photos and I chatted up the conductor! He's a super friendly guy, make sure you say hi! 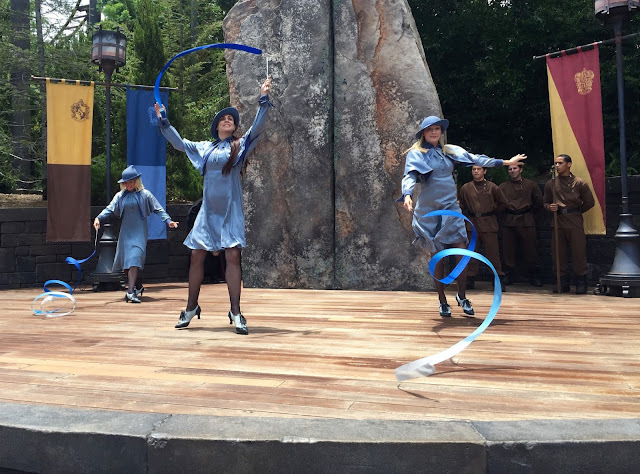 Beauxbatons & Durmstrang Show: No theme park trip would be complete without a little bit of live action entertainment. Passersby got the opportunity to watch dancing presentations from the lovely Beauxbaton ladies, and some intense tumbling from the Durmstrang dudes. You can catch a video of the Beauxbatons on Instagram! Have we convinced you that Harry Potter World is a vacation you NEED to go on? 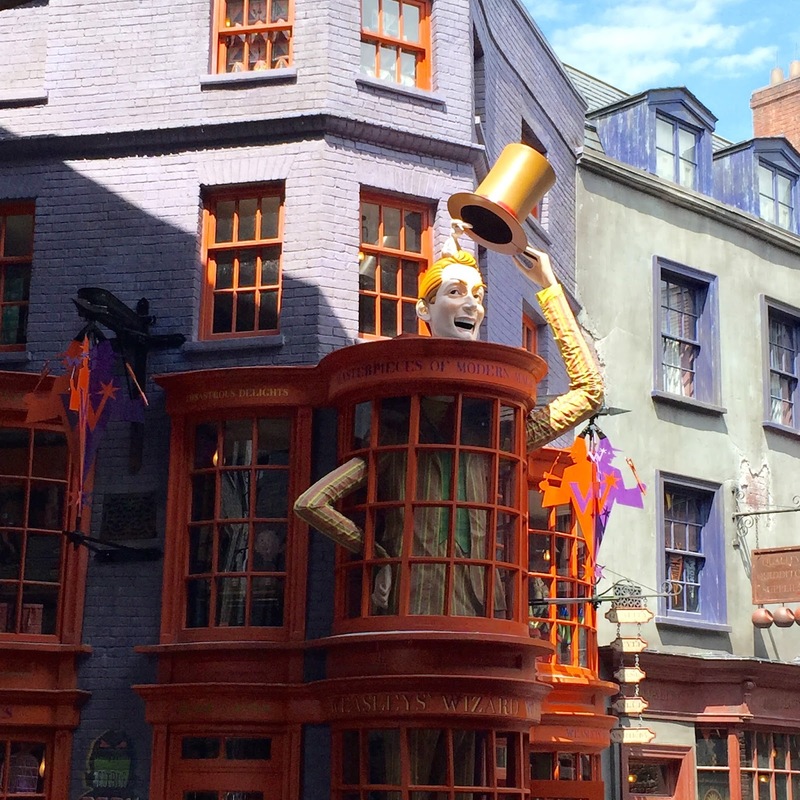 Well don't worry, we have even more coming in our next post where we'll recap Diagon Alley! Stay tuned! Hi everyone! We have something special to share with all of you today--our first ever video! We're sorry that the quality really isn't the greatest (we're learning...) but we thought it would be cool to share some fun little facts about us with all of you. 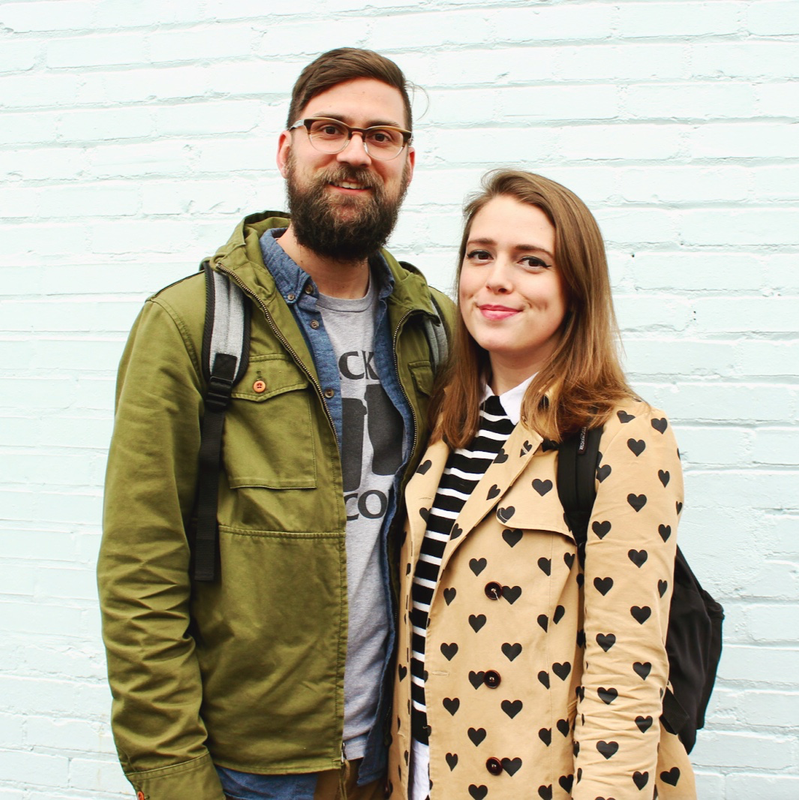 We've welcomed a bunch of new followers to the blog lately (and we're so glad you're here!) so we decided to help everyone get to know us a little better with a fun video. If you enjoy the video, be sure to give it a thumbs up on YouTube and comment below! From here, I'll just let the video speak for itself. Hope you enjoy!